Libra 30° + Scorpio 30° + 30° Sagittarius and 30 x 3 is 90 degrees; so we’re still in the Waxing Crescent Phase which is from 45 to 90°. Whew! I’m not late with this blog post. 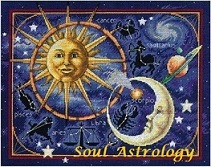 The Moon moves into the next phase when it gets to Capricorn, the next sign on the wheel. I’m not too late and the Moon didn’t leave me behind. Today the Moon is 69° into the next phase–the Waxing Crescent that follows the New Moon phase. So, right on time then, I will continue. We’re not at 90° yet. Moving right along because I’m starting to sound like the Mad Hatter of Alice in Wonderland fame. I’ve had one thing on my mind lately and so when it is said that you should plant a seed during the New Moon (dark of the Moon) or set an intention for the month, there’s no doubt about what that was for me in my life. I won’t detail that here at the moment (it’s personal for now) but may share it later. It’s still pretty new; just a seed after all and I don’t want to be digging it up or creating anything that could keep it from taking hold in the soil and pushing up above ground. More on that in a moment. The Moon entered the Waxing Crescent Phase when it was at 45° from the last Sun/Moon conjunction. What was that date? 30 Libra + 15 Scorpio = 45 degrees. The Moon hit 15 Scorpio on September 27th, 2014 in the wee hours of the morn Sunday last or late Saturday night however you prefer it depending on your bedtime, eh? That’s when the Waxing crescent phase began officially, Eastern time. So here we are… we’re in that Waxing Crescent Phase now. Something happened in my life at the end of the New Phase that relates to the seed I planted–it was only a word, a whisper, an inkling of the seed stirring, but it happened! And now well into the waxing crescent phase I find myself energizing that whisper with many thoughts, hopes, imaginings, visions. So we will see how it goes as we near the Full Moon–follow along with me through the phases and I’ll keep you posted and maybe even reveal what its all about. No promises though; we’ll see how it goes. Like I said, it’s very personal. Anyway…. back to the Waxing Crescent Moon Phase for now. Waxing. I’ve got to tell you that the choice of words there has always sort of irked me a bit. Couldn’t they come up with a more descriptive word for indicating that the Moon is growing brighter and larger in the sky? Can’t begin to tell you how many times while learning this bit of Luna lore that I’d scratch my head and say what’s waxing mean again? I think of wax as the stuff you use to make candles and I’m not sure what that…. well, “waxing” according to dictionary.com, is from the Old English weaxan; related to Old Frisian waxa, Old Saxon, Old High German wahsan, Gothic wahsjan, Whatever! So the Moon is getting larger, waxing. We just have to accept that’s what waxing means and try to remember it. After the FULL MOON it wanes (gets smaller in the sky to our eyes) and the word wane makes more sense to me. But now we have this Waxing Crescent that we’re well into now (September 29th, 2014) but the date is not much matter since we’ll be here in this phase again next month and every month thereafter, “Lord willen’ and the creek don’t rise” as that saying goes. In this phase feelings of hopefulness abound and there is a sense that lingers of that other-worldliness from the earlier phase and the impulse toward action or activity is increased yet there is a struggle to put into the outer world what the inner world is experiencing. There is the struggle with the need to withdraw from social interactions at this time of the month. Psychic work at this time will carry the tune of inspiration. A distance of 45° in astrology is called a semi-square and there is a struggle here, says Dane Rudhyar, for something concrete–a structure or mental concept. There is the shock of discovery at this angle–it’s thin and new. There can be a feeling of excitement with a tendency to want to slow down and look at things from all angles. To our eye the Moon won’t have a distinctive shape until it reaches the First Quarter 90° when it looks like that distinctive semi-circle–until then the Moon’s shape is a straight line more-or-less. There is gradual revelation in this phase which also includes the sextile (60°) and that’s where a comparison and contrast becomes evident and exciting. In our current cycle that happened when the transiting Moon was at approximately 1° Sag. (Yesterday, Sunday 9-28-14). There’s no stress with any kind of sextile and in this phase there’s a good deal going on internally. There needs to be an isolation from the external world so the soul can ponder what’s taking place and begins to think about the effort and skills needed to work in harmony with the seed that is taking shape. 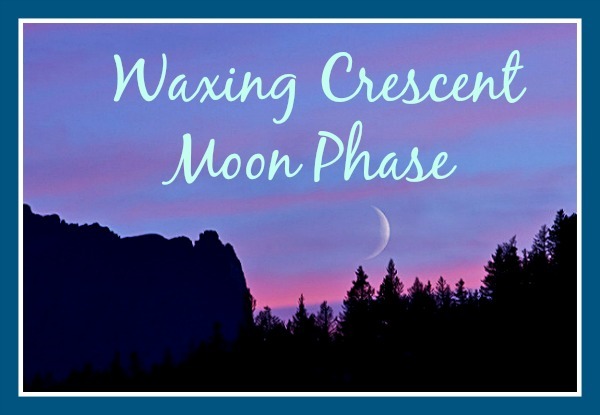 This whole waxing crescent phase is about allowing the evolutionary intent to take root–new energy with a new purpose. Keyword: allowing. And here there can be those fears… fears of the past repeating itself. No! don’t let yourself go there! We are doing evolution and NOT de-volution. Right? The Moon here in the waxing crescent phase is is young and full of possibility. If we put this in terms of seasons, we could say that the Moon here is still in “winter” and we know spring is around the corner. We still feel the ‘otherworldliness’ that carried us from the New Moon phase that came on the heels of the Balsamic phase where something was about to be conceived. It was conceived! And now the energy wants to rush out and to manifest. Before this Moon cycle began, it was abstract and we couldn’t quite conceive of how our desire or hopes could come about–it was dark and confusing but then a trace of light happened in the New Phase and into the Crescent and it has been growing all along! Sooner or later what we want to happen will–that’s the feeling now but it feels awkward still. Yet, at the same time, we’re ready to take it on, go with it, roll up our sleeves and work in harmony with it. There’s an urgency feeling of something that has to get done but you don’t want to jump the gun that’s loaded and ready to go off– it’s not gone off yet! And you don’t want to just sit there and do nothing either. There’s the struggle. There’s a feeling of not wanting to let things slip through the fingers, not wanting to miss the boat. The hands are being untied now and there’s a strong desire to use them well. Anyway, the energy now indicates that something bigger than one’s own self is about to give purpose, direction and shape to the life. I don’t know about you, but I’ll drink to that–raising my coffee cup to the Moon and the Goddess therein!